A new brewery, Liquid Mechanics, opened up last month a few miles from my house. It doesn’t have a kitchen, though you can order food from local restaurants and there are food trucks most nights. It’s a great example of the hottest business model in the brewing world: the microbrewery tap room. The rise of the microbrewery tap room has its genesis in a variety of factors. The first is the re-emergence of the microbrewery itself. As recently as 2006, more than 70% of all craft breweries were brewpubs. How quickly things change. 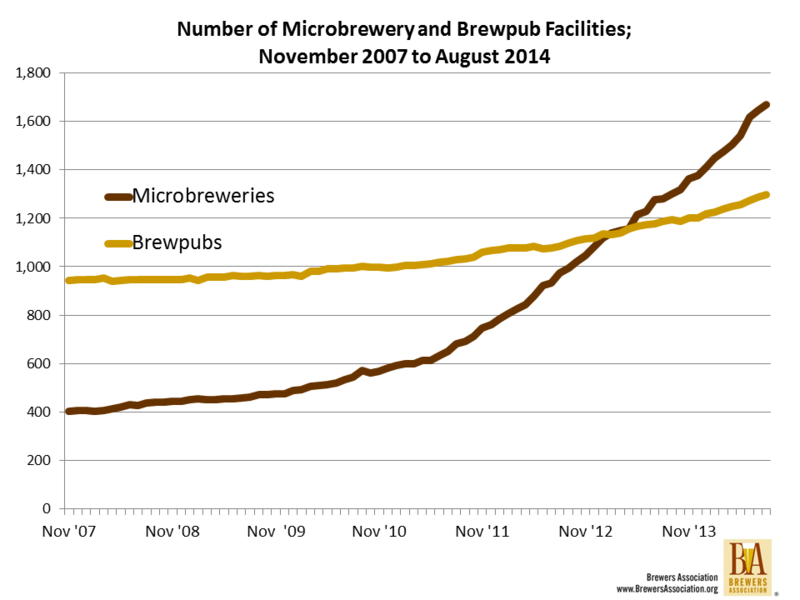 In August 2014, over 53% of all U.S. brewing facilities were microbreweries. And, if the opening trends continue, that percentage is going to seem mighty low in the coming years. Since July 2012, the net brewing facility count has increased by 976. Of that 976, 737 (76%) comes from the net increase in microbreweries. This isn’t just showing up in brewery numbers – you see it in sales to consumers too. 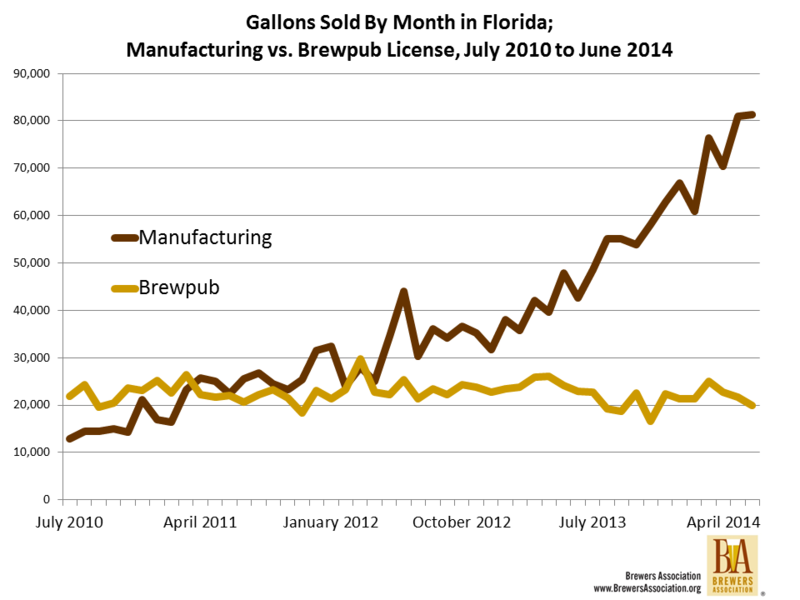 Here are the last few years of brewpub versus manufacturer license sales in Florida (note: the manufacturing license figures are direct to consumer sales only, not total production or total sales, which is how Cigar City can sell more directly to beer lovers than AB-Inbev). This makes it pretty clear what is going on in the marketplace. Brewpub sales are fairly flat (though they are up nationally), whereas sales directly from manufacturers to beer lovers (aka micro tap rooms) are booming. 1. Legislative changes allowing more direct to customer sales. 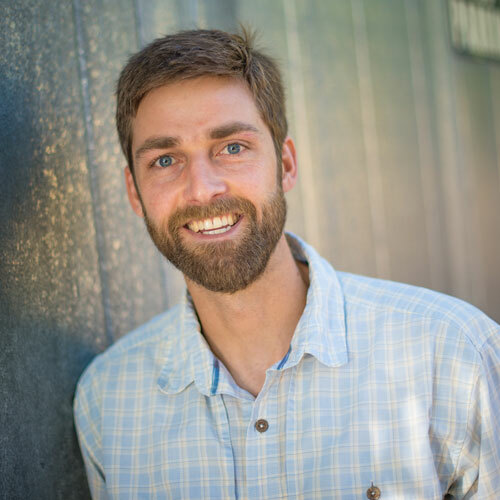 Direct to customer sales are vital to many new brewery business models. They allow customers to sample your products. They provide that close connection to the production process that makes craft beer resonate with beer lovers. And perhaps most importantly, when run well, they have a nice profit margin to offset startup costs. Increasingly, these sales are available to microbreweries as well as brewpubs (see MN, DC, TX, NY as states with recent changes making direct sales easier). Michael Pollan taught us all at the CBC that “beer is food”, but beer-food is even better when combined with non-beer food. Ten years ago a tap room without a kitchen meant popcorn, peanuts, pretzels, or if you were lucky, beef jerky. Today it means a rotating assortment of restaurant quality food. While the stats on food trucks are pretty terrible, the general consensus is that there a lot of them, and that they are only going to increase. Advantage: tap room. 3. The cost and additional expertise of starting a brewpub. Running one business is hard. Running two businesses (and the synergies between them) is harder and requires a lot more capital. Given the tightness of capital in recent years – sure interest rates are low, but good luck getting a loan – entrepreneurs have been turning to lower cost, more flexible business models across industries (one Harvard Business Review study found that in 2012 small business loans were down 21% since their pre-recession peak). 1. States that currently don’t allow direct to customer sales for manufacturers should think about them…. soon. Seriously, the tap rooms of today are the manufacturing employers of tomorrow. Don’t believe me? In South Carolina, 12 breweries have opened since the state’s pint law (150% increase). How many employees have those 12 breweries taken on? How many more will they add as they grow? 2. The on-premise environment isn’t as bad as the numbers suggest it is, rather it is simply changing. That’s around 1.65 million barrels, or about 5% of total beer on-premise volume (17-18% of ~200 million barrels). That’s a lot of beer, and the share from micros is growing. 3. Craft will continue to evolve. One of the hallmarks of the craft brewing movement has been the innovation of the thousands of entrepreneurs who have started new breweries. That innovation hasn’t been limited to beer alone, but also comes on the business side, where new methods of distribution, customer interaction, marketing, and more have re-energized American beer lovers. While the return of the tap room has been one step in that innovation, I think it’s safe to say it won’t be the last. UPDATE: Want to read more about the microbrewery tap room? Check out the cover story from the The New Brewer September/October issue.